The El Rey Ruins date back to 1200 A.D. The Mayan civilization used the El Rey Ruins for their hub for trading. 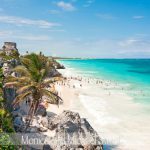 If you are vacationing in Cancun, Mexico you will want to visit the El Rey Ruins as they are an amazing archaeological site, even if these ruins are not as well known or as popular as the Chichen Itza Ruins. Visitors will not have to travel very far to see these impressive El Rey Ruins as they are located directly within the hotel zone, which is a very popular location. 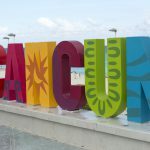 With such a fantastic and convenient location, visitors can explore the ruins and grounds in a little time because the Cancun’s El Rey is relatively small in size. The location where the El Rey Ruins are at today used to be an ancient Mayan city. As early as 1800 BC, the Mayan people have lived in different areas throughout Guatemala, El Salvador, Honduras, and in Mexico as archeologists have determined. The Cancun’s El Rey Ruins were originally very populated, but when the Spanish arrived the ruins were immediately abandoned. Today, this Ruins still has forty-seven stone structures, and when visitors go visit the ruins they can take all the time that they want to explore each of the stone structures and imagine how the typical Mayan people lived their lives. Visitors can climb up all of the tall stone structures and pay respect at the burial site. The El Rey include some impressive artwork that was done by the Mayan people. The colors and some of the details that were there are now a little deteriorated, but the images and artwork on the ruins can still be seen and depict images of kings and some of the Mayan people. With the impressive artwork and paintings, visitors have a chance to glimpse further into the daily life of the ancient Mayan people. 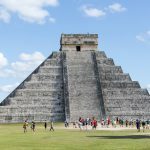 The El Rey is a way that visitors can learn about the original inhabitants even though the ruins at El Rey are not as popular as the larger, more commercialized Chichen Itza. Today, the El Rey Ruins are now being inhabited by a very large number of iguanas. All of the iguanas have become quite comfortable with daily visitors and large crowds that visit the ruins regularly. Many visitors enjoy taking photos of the El Rey Ruins iguanas. Visitors can bring fruit or bread when they are coming to the El Rey Ruins so you and your family can feed the iguanas. There are hundreds of iguanas at the ruins, and you may end up taking some of your best vacation photos at the ruins with an iguana or two. The El Rey Ruins open at 8:00 am through 4:30 pm. It only costs $2.50 USD or 50 pesos to visit the ruins. If you plan ahead for the El Rey Ruins and you go on Sunday, then you will not have to pay any admission. However, be aware that there isn’t much shade at the ruins so visitors are recommended to wear a hat and sunscreen. A tour guide can be arranged if you want to learn the history of the ruins or you can explore the ruins on your own as long as you want during operating hours. If you are driving yourself to the ruins, you can park there or visitors can take a taxi or the bus line via the R1 and R2 route to take. If you will be vacationing in Cancun, Mexico you will want to make sure you visit the El Rey. There is history, beauty, and local iguanas that you will enjoy at Cancun’s El Rey Ruins. 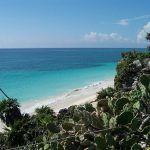 Share the post "Cancun’s El Rey Ruins"